Whitley, UK, 10 August 2016 – For 2017, Range Rover, the world’s most successful luxury SUV with over a million sales worldwide receives a suite of advanced semi-autonomous driving technologies and the introduction of the new Range Rover SVAutobiography Dynamic. Epitomising Range Rover luxury and performance, the new SVAutobiography Dynamic model is the most powerful, most dynamic production Range Rover to date. The SVAutobiography Dynamic marries the finest attention to detail with elegant and luxurious materials including diamond quilted leather seats, contrast stitching and a knurled finish rotary shift controller and pedals. Powered by a 550HP V8 supercharged engine, the SVAutobiography Dynamic, through specially configured suspension, delivers the ultimate combination of performance and handling without compromising Range Rover’s peerless comfort and refinement delivering a 0-60 time of 5.1 seconds. Range Rover continues to cement its peerless all-terrain capability through a host of Advanced Driver Assistance Systems (ADAS). Standard driver assistance technologies include Rear Park Distance Control, Cruise Control and Speed Limiter, Lane Departure Warning and Autonomous Emergency Braking (AEB). This intelligent technology uses a forward facing camera to detect a risk of collision and warn the driver initiating full emergency braking if the driver fails to respond. The additional ‘Drive Pack’ includes existing features such as Blind Spot Monitor, Traffic Sign Recognition and Reverse Traffic Detection, and new technology including Intelligent Speed Limiter, which uses the Traffic Sign Recognition hardware to automatically adjust the vehicle speed to meet the prevailing speed limit. Also included in the Drive Pack is Driver Condition Monitor which analyses data such as steering inputs and road speed, as well as taking account of the time of day, to warn against driver fatigue. The ‘Drive Pro Pack’ takes the features of the Drive Pack and adds Adaptive Cruise Control with Queue Assist and Intelligent Emergency Braking. Range Rovers fitted with Drive Pro Pack also benefit from Blind Spot Assist which automatically applies counter steering if the driver begins to change lane into the path of a following vehicle, and Lane Keep Assist which provides gentle, corrective steering input if it detects the vehicle is drifting across the white lines. Advanced Tow Assist takes any anxiety out of the difficult task of reversing while towing a trailer. Using the vehicle’s existing Surround Camera System, this technology enables drivers to guide a trailer into position with minimal effort. By following the trajectory lines overlaid on an image from the rear-facing camera displayed on the central touchscreen, Advanced Tow Assist is able to automatically steer the vehicle to follow the path selected by the driver using the dash-mounted rotary Terrain Response selector. Low Traction Launch is a manually selectable driving mode designed to assist drivers when pulling away from a standstill on slippery surfaces such as wet grass, snow or ice. By controlling the amount of torque that can be applied by the driver, the system reduces the likelihood of wheelspin to maintain traction and ensure smooth acceleration. The feature can be accessed independently through the central touchscreen and the driver is prompted to engage Low Traction Launch whenever Grass/Gravel/Snow mode is selected using Terrain Response 2. The system remains active until the vehicle reaches 30km/h. The introduction of Jaguar Land Rover’s ‘InControl Touch Pro’ infotainment system delivers improved satellite navigation functionality and connectivity. The fast, intuitive operation is augmented by the new larger 10-inch dual-view* touchscreen display, alternatively users can choose to enhance their view of the navigation system by selecting to convert the digital display behind the steering wheel to a full-screen view of their route and map, increasing visibility and minimising distraction from the road ahead. 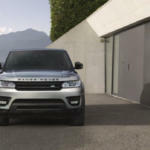 As part of an ‘InControl Connect Pro’ pack, InControl Touch Pro incorporates a series of new app services to Range Rover. InControl Remote Premium allows customers to remotely control vehicle functions such as activating the climate control to cool or heat the car ready for departure, set and deactivate the alarm, and even start the engine. The app will alert owners if their vehicle alarm has been triggered. Additional InControl Touch Pro Services include live apps that can be downloaded to provide information such as headline news, weather reporting and flight tracking. InControl Touch Pro also features ‘door-to-door routing’, an intelligent, multi-device system that navigates users to their destination whether they be on foot or behind the wheel, thanks to a Land Rover-dedicated smartphone Route Planner app. ‘Commute mode’ automatically learns frequently-used routes and recommends the most efficient route dependent on live traffic data, then shares the driver’s destination, arrival time and current location with friends, family and colleagues via a live messaging system through the driver’s smartphone. In addition to the existing engine line-up, UK customers will have the option of specifying Jaguar Land Rover's 3.0 litre V6 supercharged petrol engine. The V6 achieves 340 PS and 450 Nm of torque combined with CO2emissions of 248g/km. Effortless acceleration and power delivery produces a 0-60 time of 7.1s. The 3.0 litre V6 engine features lightweight all-aluminium construction and combines supercharging with direct-injection and variable intake, and exhaust valve timing to deliver exceptional throttle response, linear power delivery and a unique soundtrack. A single balancer shaft enhances smooth-running and refinement befitting the Range Rover badge. The level of personalisation available for 2017 Model Year Range Rover is taken to new heights with the introduction of new exterior finishes available through Jaguar Land Rover’s Special Vehicle Operations division. 19 new colours give customers more choice of metallic and pearlescent colours, widely available in either gloss or satin matte finishes. The additional palette ranges from traditional shades to bolder, more contemporary choices. The SVAutobiography Dynamic is the most powerful production Range Rover to date. Its potent 550HP 5.0-litre V8 supercharged engine is shared with the acclaimed Range Rover Sport SVR. The engine has been specifically calibrated and delivers 680Nm of torque, powering the SVAutobiography Dynamic from 0-60mph in only 5.1 seconds with a top speed of a 140mph. It is paired with ZF’s eight-speed automatic transmission for seamless gear changes and supreme performance. SVAutobiography Dynamic also features two driver-focused technologies designed to deliver improved body control and agility. Dynamic Response improves vehicle handling and occupant comfort by reducing the amount of body lean during cornering. The system controls the front and rear axles independently, delivering increased low-speed agility, superior high-speed stability and greater steering precision. Adaptive Dynamicsmonitors vehicle movements up to 500 times a second, reacting to driver inputs and changes in the road surface to provide greater control without compromising Range Rover’s peerless refinement. The Range Rover SVAutobiography Dynamic is identified by a series of unique exterior features. The side vents, bonnet finisher, grille, front bumper accents, ‘Range Rover’ script and tailgate finisher are all finished in Graphite Atlas. Customers have a choice of 21 and 22-inch alloy wheel designs, as well as three unique finishes. The SVAutobiography Dynamic is also the first Range Rover available with eye-catching red brake calipers and Brembo brake technology. The interior takes Range Rover to new heights of desirability and refinement. Diamond quilted leather seats with contrast stitching are available in four exclusive colourways, offset by Grand Black veneer front fascia and door casings and flashes of red to interior details and paddle shifters to denote its dynamic characteristics. In addition, key features, such as the rotary shift controller, start stop button and pedals have a knurled finish.